Reading Buses has now published the timetables for Green Line 702 and new 703 from Tuesday 8th May. There are some fares changes for journeys to and from London, with increases to most cash fares - from 8th May it will be substantially cheaper to buy tickets to and from London using the Reading Buses or Green Line 702 app. Reading Buses is extending its simplyNetwork Zone to include Heathrow Terminal 5, so £7 simplyNetwork Day tickets will be valid to and from Heathrow Terminal 5 from 8th May. A group ticket (up to 4 people) is also available, £15 before 09.30 Monday-Friday and £10 at all other times. The adult single fare between Bracknell and Heathrow Terminal 5 is £5.50. I'm not completely sure that the bright green goes well with the other colours. I would have preferred a completely green livery (with varying green shades) myself. But, I still really like this livery. It will help to relaunch the service. 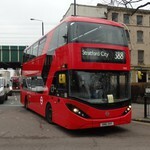 Agree - it’s a good effort but I was hoping a similar livery like the 724 Citaros would be used. As I understand it, 757 is a one-off for the royal wedding and the other 3 being repainted will end up like 1208. I'm not particularly a fan myself, the green clashes with the rest of the livery and with 'the Royal express' alongside Greenline it's a brand overload. Quite why the royal wedding needs its own livery either is questionable, but I must say the main part of it does look classy. Last Edit: Apr 30, 2018 22:05:31 GMT by Lewis J.N. Reading Buses duplicated the 18.22 and 19.22 departures from Legoland on Sunday 6th May due to demand - one of the vehicles was emerald-liveried Enviro400 MMC 772. Apparently the two duplicates had been in use on rail replacements earlier in the day so were doing this as a fill-in turn. Carousel is withdrawing the X80 Regatta route between Reading and High Wycombe, after service on Saturday 2nd June. This route competes directly with Arriva's 800/850 routes, which will continue to operate. The 800/850 are the successors to the long-established Thames Valley route 28 between the two towns. 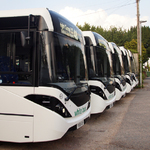 From Monday 4th June Thames Travel will extend its hourly X38 route from Henley to Reading as a partial replacement - between Henley and Reading buses will operate direct via the A4155 (same as the X80). The X38 will no longer operate around Henley Estates. Routes X39 and X40 will also have new timetables from Sunday 3rd June, and will be rerouted inbound towards Reading via Priest Hill, Caversham Library, Caversham Bridge and Vastern Road - outward route remains the same. Am I right in that Arriva started progressively upgrading the 800/850 over the last 10 years - IIRC, it went from step entrance to early low floor ALX300 B10BLE's and then to still quite young Citaros. It does now use Citaros, including 12-reg examples. I saw some in Reading at Easter. Yes, the Citaros appear to have been a direct response to the X80. They came down from the Midlands and were refurbished with leather (e-leather?) seating and painted in Arriva's "Max" livery. It's rare to see anything else on the 800/850 now. Mr Gilbert to leave Reading Buses and head to the North East. That's quite a loss for Reading Buses. It’ll be interesting to see what happens to the extra routes once a new CEO is appointed to Reading Buses. I agree that Martijn has increased the profile of the company and introduced some interesting new concepts, also improving profitability of the company however, I’ve been somewhat sceptical about some of recent new ventures and the amount of extra work taken on over a short period. It’ll be interesting to see how this is reflected in the next annual return. The Green Line routes main selling points are Windsor and Legoland and recent changes appear to reflect that. I can’t really see the London section covering costs and I do wonder whether the route can justify a new the promised batch of new vehicles. The Slough operation is small and the Heathrow corridor is competitive as companies bet on First pulling out, something they probably will do in the future once the damage has been done to others margins.